Until very recently, just 1 pharmaceutical option, sorafenib (Nexavar), was proven superior to placebo for patients with unresectable HCC.4 Sorafenib inhibits several intracellular and cell-surface kinases, halting angiogenesis and tumor growth.11 Evidence from the Asia-Pacific trial and the SHARP trial demonstrate the improved OS of patients treated with sorafenib versus placebo in the treatment of unresectable HCC with macrovascular invasion and/or extrahepatic disease. 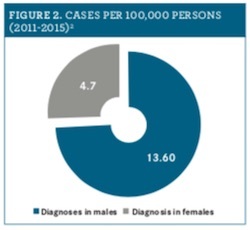 However, in clinical practice, some patients experience disease progression despite treatment with sorafenib.12,13 The undoubtedly grim outcome for patients with advanced disease, especially in the setting of primary therapy failure, is a resounding call for novel treatment strategies. HCC has traditionally been refractory to medical, radiological, and surgical management. Since the advent of sorafenib and a succession of promising targeted biologic chemotherapy agents, a window of hope is opening for more successful pharmacological options in the treatment of HCC. As with most milestones in medicine, we often build upon our previous successes, thus providing a promising path to the future. Jerry A. Barbee Jr, PharmD, BCPS, CPh, and Glenn Schulman, PharmD, MS, BCPS, BCACP, BCGP, BCIDP, are clinical pharmacists in Pensacola, Florida. Elizabeth Shald is a PharmD candidate at the University of Florida in Gainesville. U.S. Department of Health and Human Services. Adult primary liver cancer treatment (PDQ)–health professional version. 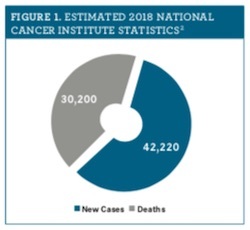 National Cancer Institute website. cancer.gov/types/liver/hp/adult-liver-treatment-pdq. Updated February 6, 2018. Accessed October 29, 2018. Cancer Stat Facts: Liver and Intrahepatic Bile Duct Cancer. Acute Myeloid Leukemia-Cancer Stat Facts. seer.cancer.gov/statfacts/html/livibd.html. Accessed November 14, 2018. Tsai WC, Kung PT, Wang YH, Kuo WY, Li YH. Influence of the time interval from diagnosis to treatment on survival for early-stage liver cancer. Plos One. 2018;13(6):e0199532. doi:10.1371/journal.pone.0199532. Marrero JA, Kulik LM, Sirlin CB, et al. Diagnosis, staging, and management of hepatocellular carcinoma: 2018 practice guidance by the American Association for the Study of Liver Diseases. 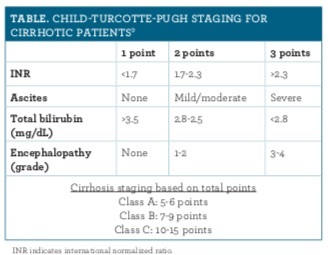 Hepatology 2018;68(2):723-750. doi: 10.1002/hep.29913. Orcutt ST, Anaya DA. Liver resection and surgical strategies for management of primary liver cancer. Cancer Control. 2018;25(1):1073274817744621. doi: 10.1177/1073274817744621. Llovet JM. Tumors of the liver and biliary tree. In: Jameson JL, Fauci AS, Kasper DL, Hauser SL, Longo DL, Loscalzo J. eds. Harrison's Principles of Internal Medicine. 20th ed. New York, NY: McGraw-Hill; 2018. Dhanasekaran R, Bandoh S, Roberts LR. Molecular pathogenesis of hepatocellular carcinoma and impact of therapeutic advances. F1000Res. 2016;5:F1000 Faculty Rev-879. doi: 10.12688/f1000research.6946.1. Heimbach JK, Kulik LM, Finn RS, et al. AASLD guidelines for the treatment of hepatocellular carcinoma. Hepatology. 2018;67(1):358-380. doi: 10.1002/hep.29086. Pugh RN, Murray-Lyon IM, Dawson JL, Pietroni MC, Williams R. Transection of the oesophagus for bleeding oesophageal varices. Br J Surg. 1973;60(8):646–649. Llovet JM, Fuster J, Bruix J, Barcelona-Clínic Liver Cancer Group. The Barcelona approach: diagnosis, staging, and treatment of hepatocellular carcinoma. Liver Transpl. 2004;10(2 Suppl 1):S115-20. Nexavar (sorafenib) [prescribing information]. Wayne, NJ: Bayer HealthCare Pharmaceuticals, Inc; 2010. accessdata.fda.gov/drugsatfda_docs/label/2010/021923s008s009lbl.pdf. Accessed November 26, 2018. Rimassa L, Santoro A. Sorafenib therapy in advanced hepatocellular carcinoma: the SHARP trial. Expert Rev Anticancer Ther. 2009;9(6):739-745. doi: 10.1586/era.09.41. Cheng AL, Kang YK, Chen Z, et al. Efficacy and safety of sorafenib in patients in the Asia-Pacific region with advanced hepatocellular carcinoma: a phase III randomised, double-blind, placebo-controlled trial. Lancet Oncol 2009;10(1):25-34. doi: 10.1016/S1470-2045(08)70285-7. Bruix J, Qin S, Merle P, et al. Regorafenib for patients with hepatocellular carcinoma who progressed on sorafenib treatment (RESORCE): a randomised, double-blind, placebo-controlled, phase 3 trial. Lancet. 2017;389(10064):56-66. doi: 10.1016/S0140-6736(16)32453-9. El-Khoueiry AB, Sangro B, Yau T, et al. Nivolumab in patients with advanced hepatocellular carcinoma (CheckMate 040): an open-label, non-comparative, phase 1/2 dose escalation and expansion trial. Lancet. 2017;389(10088):2492-2502. doi: 10.1016/S0140-6736(17)31046-2. Zhu AX, Finn RS, Edeline J, et al. Pembrolizumab in patients with advanced hepatocellular carcinoma previously treated with sorafenib (KEYNOTE-224): a non-randomised, open-label phase 2 trial. Lancet Oncol. 2018;19(7):940-952. doi: 10.1016/S1470-2045(18)30351-6. Ikeda M, Sung MW, Kudo M, et al. A phase 1b trial of lenvatinib (LEN) plus pembrolizumab (PEM) in patients (pts) with unresectable hepatocellular carcinoma (uHCC). J Clin Oncol. 2018;36(suppl; abstr 4076). U.S. National Library of Medicine. A study of the safety and efficacy of atezolizumab administered in combination with bevacizumab and/or other treatments in participants with solid tumors - full text view. ClinicalTrials.gov website. clinicaltrials.gov/ct2/show/study/NCT02715531. Accessed November 14, 2018.